This chapter draws on material from an anthropological study of the asylum process in France, conducted between 2007 and 2009, to explore the following questions: What can ethnographic research contribute to knowledge and understanding of the kinds of communication that take place at successive stages of the refugee status determination process in France? What light can it throw, more specifically, on the relationship between forms of communicative practice and the different contexts or spaces in which interaction between those involved occurs? Finally, what are some of the difficulties associated with adopting an ethnographic approach to investigate asylum processes and how can researchers attempt to address these? 25 years ago, Michael Burawoy stated in the introduction to a collection of ethnographic studies conducted in the San Francisco Bay Area that the book’s aim was ‘to unchain ethnography from its confinement as a quaint technique at the margins of social science’ (Burawoy 1991: 3). Since then, ethnographic research has moved to occupy if not centre-stage then at least a prominent place in many academic disciplines and fields of inquiry (Davies 2008: ix). 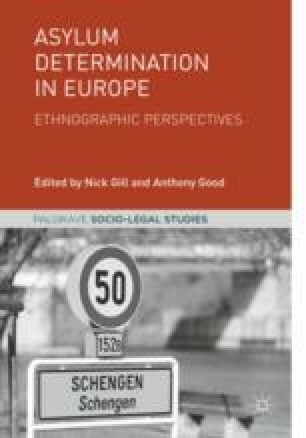 Contemporary research on asylum determination in Europe, as Nick Gill and Anthony Good note in their introductory chapter to the present volume, frequently adopts an ethnographic approach. This is certainly the case for research on asylum processes in France, where an ethnographic perspective has recently been brought to bear on, among other subjects, reception centres for asylum applicants (Kobelinsky 2010), refugee-support organisations (d’Halluin-Mabillot 2012), decision-making at the French National Court of Asylum (Kobelinsky 2014, and this volume) and the role of interpreters (Gibb and Good 2014). Against this background, I draw in the present chapter on material from an ethnographic study of the asylum process in France in order to explore the following questions: What can ethnographic research contribute to knowledge and understanding of the kinds of communication that take place at successive stages of the refugee status determination process in France? What light can it throw, more specifically, on the relationship between forms of communicative practice and the different contexts or spaces in which interaction between those involved occurs? Finally, what are some of the difficulties associated with adopting an ethnographic approach to investigate asylum processes and how can researchers attempt to address these? In a classic ethnographic study of an English Crown Court, Paul Rock (1993: 6–7) emphasised that space and time were key factors influencing the behaviour and experiences of prosecution witnesses. Similarly, a central concern of this chapter will be to explore how communication and interaction between different participants in the French asylum process are shaped in part by specific features of the built environment in which they take place. After providing a brief overview of the refugee status determination process in France (as it operated in 2008–2009, when I carried out most of my research), I will examine in turn forms of communication in ‘admissibility interviews’, asylum interviews and appeals hearings, and offices and corridors. In so doing, my aim is to show that one of the advantages of adopting an ethnographic approach when conducting research on administrative and legal asylum determination procedures is that it throws light on the wide range of different types of communication and interaction that occur within them. Determining the specific impact of each of these on the decision-making process is not a straightforward matter, but I will suggest that describing and analysing them can deepen our understanding of the different contexts in which those involved in the asylum process communicate and interact with each other. The chapter is based on ethnographic research I completed in the Paris region between 2007 and 2009 as part of a comparative study of asylum procedures in the UK and France conducted in collaboration with Anthony Good. This definition draws attention to two specific points that I discuss further in later sections. The first is that ethnographic research involves using a number of different methods; in other words, ethnography is not ‘a method’ or a synonym for ‘participant observation’, even if it is often presented in this way (e.g. Flood 2005: 33, 43 and 46). The second is that ethnography refers not only to a set of research techniques but also to the ‘eventual written product’, one that characteristically attempts to provide a detailed description and fine-grained analysis of the activities studied (Davies 2008: 4–5). Each of these two dimensions of ethnography poses its own challenges. For if, as John Flood (2005: 34) has suggested, ‘the core of ethnography is to be alert and attentive to everything around you not just particular segments of theoretical reality’, how can this be achieved in practice through specific research methods, and be adequately reflected in the subsequent written account? I return to this question in each of the three sections of the chapter where I introduce material from my fieldwork in France. The present chapter and the others in this section of the book are centrally concerned with the issue of communication during the asylum determination process, and communication, like ethnography, is a term that can be used in different ways. In what follows the focus is on communicative practices, based on a view of communication as ‘situated action’ and of meaning as ‘an active process of here-and-now projection and inferencing, ranging across all kinds of percept, sign, and knowledge’ (Blommaert and Rampton 2016: 27). This approach is informed by a number of important advances in the study of communication within linguistic anthropology and social/cultural theory, which, in my view, point to specific ways of developing ethnographic research on communicative practices in the asylum process. Drawing on Jan Blommaert and Ben Rampton’s (2016: 26–33) useful review of linguistic-anthropological and other research on communication, I would like therefore to highlight here four key ideas that have guided the analysis presented later in the chapter. The first is that meaning is not communicated solely through language, but is instead ‘multimodal’: ‘People apprehend meaning in gestures, postures, faces, bodies, movements, physical arrangements and the material environment, and in different combinations these constitute contexts shaping the way in which utterances are produced and understood’ (2016: 27). The second is that ‘non-shared knowledge’ and ‘inequalities in communicative resources’ can be ‘systematically patterned in relations of power’ (2016: 28–29, italics omitted). The third is what Blommaert and Rampton refer to as ‘metapragmatic reflexivity’, that is, the ways in which people reflect on their own and others’ communicative practices (2016: 31–32). The final insight relates to the value of ‘a multi-sited description of communications beyond, before and after specific events’, through attending to processes of entextualisation, transposition and recontextualisation (2016: 32–33). These four ideas underpin the analysis of communicative practices in the French asylum process presented later in the chapter. As has just been noted, communicative practices are influenced in part by the contexts in which they take place. In this chapter, I am interested, specifically, in exploring how different ‘contexts of interaction’ affect communication between those involved in refugee status determination procedures in France. The focus then is on social interaction, understood as ‘that which uniquely transpires in social situations, that is, environments in which two or more individuals are physically in one another’s response presence’ (Goffman 1983: 2). At successive stages of the asylum process different sets of individuals interact, and I examine how the number of people present and the roles they play shape the nature of the communicative practices that occur and also how those concerned experience them. However, I also use the phrase “contexts of interaction” to refer to the different physical settings or locations in which individuals interact. Most obviously, these include the booths where asylum interviews are conducted and the courtrooms where appeals against negative decisions are heard, but I also examine the importance of communicative practices in two other kinds of space: staff offices and corridors. In so doing, my aim is to provide the kind of multi-sited description of forms of communication referred to above, one that is able to trace connections between what happens in different settings as opposed to viewing each in isolation from the others. The phrase “contexts of interaction” is also intended, finally, to direct attention to the possible impact of features of the built environment—for example, the size and layout of rooms—on communicative practices in the asylum process. This chapter is based on ethnographic research conducted in the Paris region between 2007 and 2009. It focused on the working practices of state officials, judges, interpreters, lawyers and members of refugee-support organisations (rather than on the experiences of asylum applicants themselves), and involved observation and semi-structured interviews (in French) in three different fieldsites, as well as documentary research. Firstly, I observed asylum interviews conducted by case-workers from the French Office for the Protection of Refugees and Stateless People (Office français de protection des réfugiés et apatrides/OFPRA), and I also interviewed case-workers (officiers de protection), heads of unit and interpreters who worked at the OFPRA. Secondly, I interviewed judges, rapporteurs and heads of unit at the French National Court of Asylum (Cour nationale du droit d’asile/CNDA), where I also attended asylum appeal hearings; in addition, I observed preparatory meetings between barristers (avocats) and their clients. Thirdly, I carried out participant observation research in a drop-in centre for asylum applicants run by a refugee-support organisation. The chapter presents and analyses material from the first two of these fieldsites. After providing an overview of the asylum process in France as this existed during the central period of my fieldwork (2008–2009), I focus in turn on communicative practices in the following contexts: ‘admissibility interviews’ at the border; asylum interviews and appeal hearings; and staff offices and corridors. In each case, I preface my discussion by briefly considering the methodological issues that arose when researching the particular ‘context of interaction’ in question. In France, the authority responsible for taking the first decision on an asylum application is the French Office for the Protection of Refugees and Stateless People (OFPRA). Created in 1952, the OFPRA is a public institution with legal personality and financial and administrative autonomy (CESEDA 2009: L.721-1). Its head office is located in Fontenay-sous-Bois, which is 11-kilometres to the east of Paris. Appeals against negative decisions by the OFPRA are examined by an administrative court, the French National Court of Asylum (CNDA) (CESEDA 2009: L.731-1), which is also situated near Paris, in the town Montreuil. In 2008, when most of the fieldwork on which this chapter is based was conducted, the OFPRA registered 42,999 applications for asylum (OFPRA 2009: 10), and the CNDA 21,636 appeals (CNDA 2009: 7). The following overview of key elements of the asylum procedure in France, as this operated during the main period of the research (2008–2009), focuses on ‘admissibility interviews’ and asylum interviews conducted by OFPRA case-workers, and on asylum appeal hearings at the CNDA. In 2008, 5100 people arriving in France at an airport or port applied for admission to French territory on asylum grounds (OFPRA 2009: 26). There is a specific procedure under French law in relation to asylum applications lodged at the border. If the person does not possess a valid travel document permitting them to enter French territory, they can be held in a ‘waiting zone (zone d’attente)’ while their admission request is examined. At the time of my research, a case-worker from the OFPRA’s Asylum at the Border Division was responsible for conducting what I will refer to here as an ‘admissibility interview’ with the applicant, in order to determine whether or not their application was ‘manifestly unfounded’ (CESEDA 2009: L.221-1).1 In the case of applicants held in the waiting zone at Roissy Charles-de-Gaulle airport outside Paris, OFPRA case-workers conducted these interviews face to face in offices provided by the Interior Ministry inside the zone, with the assistance of an interpreter (where necessary) via a telephone.2 After the interview, the OFPRA case-worker formulated an opinion (avis) on the application, which, subject to approval by the Head of the Division, was then communicated to the Interior Ministry. If the application was not considered manifestly unfounded, the person would be allowed to enter French territory in order to lodge an asylum application with the OFPRA in the same way as an in-country applicant (see below). At the time of the research, a person on French territory seeking asylum had first to apply for temporary leave to remain at the Préfecture of their place of residence. At the Préfecture they would be given a copy of the asylum application form, which had to be returned to the OFPRA within three weeks (OFPRA 2011: 89). After being received by the OFPRA, an asylum application was assigned to a case-worker, a state employee recruited through competitive examination to either a permanent or a temporary post, and who belonged to a specific branch of the civil service (fonction publique). In most cases, the case-worker would subsequently interview the applicant, usually at the OFPRA’s head office outside Paris. Interviews there were held in small booths, roughly four to five square metres in size, the top half of which was made of clear glass (Cimade 2010: 23; OFPRA 2011: 103–104). The case-worker and applicant would sit facing each other across a table, with the interpreter (where one was present)3 usually sitting at the side of the table, at right angles to the other two. Since 2005, each booth has also been equipped with a computer, which case-workers would use to transcribe their questions and the applicant’s answers for the ‘report (compte-rendu)’ of the interview. Asylum interviews varied considerably in length, but usually lasted between an hour and an hour and a half. They tended to be divided into two parts: in the first, the caseworker sought to establish the applicant’s identity and to collect other basic personal information; in the second, the focus was on the applicant’s narrative and reasons for applying for asylum. After the interview, the caseworker would forward a proposal to accept or reject the application to the head of their section (or division), the person responsible for signing the final decision. The applicant would then be sent a letter informing them of the outcome of their application. As noted above, appeals against the OFPRA’s decisions are examined by the National Court of Asylum (CNDA). Appellants are entitled to be assisted by a barrister (conseil) and an interpreter at their appeal before the CNDA. Before the hearing, a CNDA rapporteur prepares a written report on the appeal, concluding with an opinion (avis), based on the current state of the case-file, as to whether it should be accepted or rejected. In 2008–2009, most appeals at the CNDA were heard by panels of three judges. The chair (président) of each panel was a magistrate drawn from the administrative, financial or civil branches of the judiciary. The other two members of the panel were usually not magistrates and were commonly referred to as the ‘HCR assessor (assesseur HCR)’ and ‘Administration assessor (assesseur de l’Administration)’ respectively. The former, who had to be a French national, was nominated by the United Nations High-Commissioner for Refugees with the assent of the vice-president of the Council of State, while the Administration assessor was nominated by one of the Ministers represented on OFPRA’s Governing Board. At the time of the research, both types of assessor, like the vast majority of magistrates, sat at the CNDA on a part-time basis (CESEDA 2009: L722-1). Appeal hearings are held in large rooms at the Court, where the panel of judges sit behind a long table with their backs to the window. The chair of the panel is in the middle, flanked on either side by the ‘Administration assessor’ and ‘HCR assessor’ (to the chair’s right and left respectively). Two other tables are placed at right angles to each side of the main table, forming an upside-down ‘U’ shape. The rapporteur sits behind the table on the side nearest the ‘HCR assessor’, while the clerk is seated at the opposite table, on the side nearest the ‘Administration assessor’. The appellant sits in the middle of another table, facing the panel of judges (and therefore with his or her back to the rest of the room). If a barrister and/or an interpreter are present, they sit at the same table, to the appellant’s right and left respectively. CNDA hearings are public (although the chair can order a closed session), and there are rows of seats just inside the door, where family members and friends, as well as appellants, barristers and interpreters waiting for their case to be called, can all sit. In 2008, a panel of judges at the CNDA could hear up to 13 different appeals in any one morning or afternoon session. How long the hearing of an individual case lasts varies, depending on its complexity and a number of other factors. However, the Cimade (Comité inter-mouvements auprès des evacués), a French association that provides legal advice and other support to asylum seekers and refugees, observed 203 cases at the CNDA over a three-month period in 2009 and found that the average time taken to hear an individual appeal—including the report, which the rapporteur would read out at the start, and the barrister’s statement—was 33 minutes (Cimade 2010: 47). At the end of the session, the room is cleared and the three judges discuss all the appeals that have just come before them, deciding in each case whether to annul the OFPRA’s original decision (and therefore grant refugee status or subsidiary protection) or to reject the appellant’s appeal against this decision. A letter is subsequently sent to the appellant, informing them of the outcome of their appeal. This overview of successive stages in the refugee status determination procedure in France, as these existed at the time of the research,4 has introduced three of the ‘contexts of interaction’ that form the focus of the remaining sections of this chapter. I begin by examining forms of communicative practice in ‘admissibility interviews’ between asylum applicants and OFPRA case-workers inside the waiting zone at Roissy Charles-de-Gaulle airport. I then describe and compare issues of communication in OFPRA interviews and CNDA appeal hearings, highlighting, among other points, how the physical setting in which they take place can affect the experience of those involved. Finally, I turn to consider two further places—staff offices and corridors—that the research showed were also contexts in which important kinds of communication occur during the asylum process. Towards the end of my research in France, the Head of OFPRA’s Asylum at the Border Division kindly arranged for me to visit the ‘waiting zone’ at Roissy Charles-de-Gaulle airport outside Paris and observe a series of admissibility interviews between case-workers and asylum applicants there. In this section, I focus on one of the interviews, and discuss the problems of communication that arose during it, and the implications for those involved. Before doing so, however, it is important to draw attention to the practical difficulties social scientists face in such situations, where tape recording is impossible and an official transcript either does not exist or is not available, with respect to the production of a full and accurate account of the proceedings. As Anthony Good (2007: 42–46) has explained, even with ‘much frantic scribbling’, the researcher is unlikely to be able to note down everything that is said ‘verbatim’, and so must decide what to record (and not to record) and, crucially, whether in later writing to paraphrase the exchanges or to present them as ‘dialogue’. In his anthropological study of the role of expert evidence in the UK asylum courts, Good opted to use direct quotations, but nevertheless emphasised that the ‘dialogues’ he reproduced were ‘not verbatim transcripts, although every effort has been made to make them accurate and intelligible, while not falsifying or misrepresenting the sense of what was said’ (2007: 46). I adopt a similar approach, in this section of the chapter and the next, regarding the presentation of translated extracts from the hand-written notes I took in French when observing admissibility interviews, asylum interviews and appeal hearings in France. When the assistance of an interpreter is required for an admissibility interview conducted by an OFPRA case-worker with an asylum applicant at the border, this is usually provided by telephone. One of the interviews I observed in the waiting zone at Roissy Charles-de-Gaulle airport involved telephone interpreting, a service for which the OFPRA had signed a contract with a company. In the interview room, the case-worker and applicant sat opposite each other at a table, on top of which there was a conferencing phone unit incorporating a loud speaker and a microphone. When the applicant was brought to the interview room, the case-worker invited him to sit down at the table, and, after establishing that the man spoke neither French nor English, phoned the number of the interpreting services provider and was connected to an operator. (Introduces himself and explains why he is ringing.) Do you have an interpreter available in (name of language) for an asylum application by a man from (name of country X)? Just one case (dossier). (There is a pause while she checks.) In (language) of (country X), there is no-one available at the moment. However, there is an interpreter available in (same name of language) from (country Y). Do you want to try? OK. We’ll see how it goes. He says to me that he doesn’t understand me. He doesn’t want to continue with you? We tried using an interpreter in (language) of (country Y) for an asylum application, but my applicant says that he doesn’t understand. Can you try to find me another interpreter, in (language) of (country X). I’m sorry, but I haven’t been able to find an interpreter in (language) of (country X). Do you want me to keep trying? I was just phoning to see how things were coming along. I’m still trying, but I’m not certain I’ll be able to find an interpreter. Shall we give up then? What shall we do? I’ve found an interpreter! Please wait a few moments. In (language) of (country X)? I have been cut off with my interpreter. I’ll try to reconnect you. I’ve been unable to re-connect you with the interpreter, but I’ve found another interpreter in (language) of (country X). This example highlights some of the potential barriers to achieving effective communication in the asylum process. These include the challenge of obtaining an interpreter in the appropriate language (as Dahlvik, this volume, attests), especially at very short notice, and the problem of relying on telecommunications devices such as telephones to provide interpreting services.5 There is also, of course, the wider issue of the likely impact of the context of interaction itself on the communicative practices of those involved, in particular the asylum applicant. As a French non-governmental organisation has pointed out, the fact that the admissibility interviews are conducted inside the waiting zone, which is a place of detention, means that the applicant may not necessarily perceive the OFPRA case-worker to be ‘neutral and independent of the border police’ (Anafé 2008: 10, my translation). This could result in a reluctance on the part of the applicant to communicate fully to the case-worker the reasons for their application to be admitted to French territory. The opportunity to observe the admissibility interview discussed above provided me with an insight, finally, not only into some of the communication problems that can arise in such contexts but also into the immediate implications of these for both the applicant and the case-worker. At the end of the interview, which had lasted almost two hours, with several false starts and delays, and the involvement of three different interpreters, the applicant must have felt exhausted. The interview must have been tiring and frustrating for the case-worker too, and he now found himself, as he explained to me once the applicant had left the interview room, in the situation of having just over half an hour to prepare decisions on several applications before he was due to finish work for the day. ‘I don’t know how I’m going to manage it’, he said to me. An hour and a half later, when the Head of the Asylum at the Border Division and I left the waiting zone, the case-worker was still there drafting his decisions. Two of the most important contexts where the issue of communication arises during the refugee status determination process are asylum interviews and appeal hearings. Many different kinds of communicative practice can occur during these events, and the aim of the present section is to explore some of these. I consider in turn OFPRA asylum interviews and appeal hearings at the CNDA, before briefly comparing the two contexts. The discussion focuses on how features of the built environment affected the communicative practices and interactions that took place in the interview booths and hearing rooms. As noted earlier, adopting an ethnographic approach involves an attempt ‘to be alert and attentive to everything around you’ (Flood 2005: 34), and this led me, when observing asylum interviews and appeal hearings in France, to notice how different the physical settings were in which they were conducted, and then, in subsequent interviews with key participants, to want to investigate the implications of this further. There are things that you [i.e. the interpreter] can feel (ressentir) by body movements or gestures, and which the case-worker will not necessarily see. Here too we shouldn’t delude ourselves: the case-worker is in the process of examining the application, and they are asked to pay attention to this sort of detail, but at the same time they have to write, since everything must be recorded in minute detail. We [i.e. interpreters] are sitting facing the applicant. We see their body movements, we see everything that happens, we’re aware if they hesitate or are in distress. We are so busy all the time typing the interviews – we have our eyes glued to the screen – that the relationship (échange) with the applicant can be difficult to establish. We don’t look the applicant in the eye during the whole interview. Thus it’s very difficult to establish contact. The drawback of the computer is that we look at the applicant less. As a result, you are in your bubble, and it’s happened to me that suddenly I’ve heard the applicant cry and I’ve said to myself, ‘Damn (mince), what’s happened?’ I didn’t see it coming in fact. What the above extracts highlight is how the adoption of a specific procedure for the entextualisation of an asylum interview, involving in this case a modification of the physical environment through the addition of a desktop computer to be used by the case-worker, affects the process of communication. There are certain presidents who ask the rapporteur at the end if they have a question to ask. It’s quite rare. It’s a personal choice […]. But it is possible for us to intervene. We have little, informal practices (petites pratiques) with the HCR assessors, because it’s the assessor who is seated nearest to us. So, sometimes there’s a question that hasn’t yet been raised, and which, for us, is really decisive. We write a little note, we ask the assessor if they would mind asking the question. But otherwise we do not normally intervene at all. In other words, the seating arrangements facilitated informal interaction and communication between the CNDA rapporteur and HCR assessor during the actual proceedings. I did not observe such occurrences very often and their significance should not be over-stated, but they are the kind of ‘detail’ that ethnographic research can highlight, thereby contributing to a broader and deeper understanding of different forms of communicative practice in the asylum process. The environment [at the OFPRA] is exhausting in fact. The booths are very small, the lighting plays a part too, the noise of the computer: all that contributes to (joue sur) the tension. It’s similar (proche) to a police interrogation; at least, you could say that the conditions are similar to that. Therefore, I think that it’s a lot more exhausting than in the [hearing] room. Here [at the OFPRA] we are in a different setting. We are a bit as if we were en famille, in inverted commas. We are in a small booth […]. We are closer, both to the applicant and the case-worker. So, we are a bit more relaxed, in the way of working […]. Whereas at the Commission [the CNDA], the hearings are public. We have to deal with everything that surrounds us: the noise from the corridors, people who are speaking [in the rows of seats] behind, crying babies, the panel of judges, the rapporteurs, and the lawyer. There’s a certain number of actors who intervene and you have to put everything together […]. Several people consider that it’s easier to work at the OFPRA, because we are in a more relaxed setting. What these comments highlight is the fact that individuals do not necessarily experience in the same way how characteristics of a particular setting influence the nature of the interaction and communication processes taking place within it. This may seem an obvious or even banal point, but I would argue that it is differences such as these that an ethnographic perspective can reveal, thereby contributing to a more detailed description and nuanced analysis of the asylum process. Significant forms of communication and interaction between participants in the refugee status determination process occur not only in asylum interviews and appeal hearings (although these are clearly crucial events) but also in other contexts. In this final section, I explore some of what happened, during the time of my fieldwork, in two much less prominent settings: the offices of OFPRA case-workers and CNDA rapporteurs, and the corridors6 and waiting areas of the CNDA building. While I had access to the latter, I did not carry out observational research actually in staff offices. However, case-workers and rapporteurs talked to me about their offices when I interviewed them. This illustrates how an ethnographic approach, involving the combined use of several different research methods, has the potential to generate a multi-sited description of forms of communication, the importance of which has been emphasised by Blommaert and Rampton (as mentioned above). What plays a role too is even the material structure itself. Obviously I talk with the people with whom I share my office. We are in a big office; there are four of us. It’s true that we discuss the files, and I know that in our office if there’s one of us who’s working on a file and is asking herself a question about it, she interrupts the other three, asks them her question, and they reflect on it. We all do that, in fact. Other case-workers and rapporteurs also emphasised the importance of open plan or shared offices (as well as corridors and staff canteens) for the ‘socialisation’ of newly appointed staff, ‘collective work’ and the informal ‘pooling (mutualisation)’ of knowledge, experience and information. This highlights that while case-workers and rapporteurs ultimately are individually responsible for examining particular asylum applications and preparing reports on specific appeals, respectively, it would be a mistake to view them as working in isolation throughout the whole process. Both before and after their involvement in asylum interviews or appeal hearings, they are engaged in forms of communicative practice with colleagues, in offices and other spaces, and these help to shape their work. The final ‘contexts of interaction’ I wish to consider (albeit very briefly) in this chapter are the corridors and waiting areas of the CNDA. I went to the Court on a regular basis over a period of nine months in order to observe appeal hearings, and I was struck by the amount of communication and interaction between participants that occurred outside the actual hearing rooms. In the waiting areas, for examples, secretaries would check that appellants, interpreters and barristers were present for particular hearings, and appellants sitting there would sometimes start talking to each other. Conversations involving judges, and sometimes also rapporteurs, interpreters and lawyers, would also take place in the corridors on the way to and from the coffee-machine during breaks between hearings, while barristers and their clients might have brief exchanges on their way to and/or from the hearing rooms. The significance of corridors emerged particularly clearly in the interviews I conducted with interpreters who worked at the CNDA. Several interpreters explained to me, for example, that there was a tendency for appellants to try to make contact with them there, or for barristers to request their assistance (‘Can you give me five minutes’ help to explain two or three things to the appellant?’). In order to maintain their neutrality, they would therefore try to avoid putting themselves in that position. As one interpreter commented: ‘We are obliged not to move about too much in the corridors and so on. We stay in the hearing room [while waiting to interpret in a particular case], but even there, they come looking for us!’ Another interpreter contrasted the open, public nature of the CNDA hearings with the more closed environment of the OFPRA asylum interviews. In the latter, he remarked, the interpreter was already in the booth when the applicant entered after being called from the waiting area by the case-worker, and this contributed to creating a more formal atmosphere from the start. In this section I have identified a number of different types of communication that occurred in staff offices, and in corridors and other spaces, during the asylum process in France at the time of my research. Each merits a much more detailed examination than I have been able to provide here. However, I have included them in this chapter in order to illustrate the point that an ethnographic approach to studying the asylum process can—and, I would argue, should—throw light not only on asylum interviews and appeal hearings, but also on what happens in other relevant (but less central) contexts. This chapter brings an ethnographic perspective to bear on the issue of communication at different stages of the refugee status determination process in France. One of the advantages of adopting an ethnographic approach, not only to this specific question but also to the study of the asylum process more generally, lies in both the depth and the breadth of understanding it offers of the activities concerned. On the one hand, it can provide a richly detailed, contextualised account of a particular phenomenon; on the other, it holds out the possibility of tracing connections between apparently unrelated or distant phenomena. In this chapter, for example, I have sought to document forms of communicative practice in a range of ‘contexts of interaction’ involving participants in the French asylum process, and at the same time to show some of the links that exist between what happens in these different settings. This has led me, in a similar way to Rock (1993) in his ethnographic study of an English Crown Court, to explore ways in which space—and notably aspects of the built environment—can affect interactions between participants in legal (and administrative) processes and how these are experienced by those involved. In order to do this, it was necessary to use two main research methods: observation played an important part, but so did semi-structured interviews, generating valuable insights into forms of communicative practice I was not able to observe directly as well as into participants’ reflections on their own and other people’s situated actions. As I argue at the start of this chapter, ethnography is most appropriately viewed not as ‘a’ method or just another word for participant observation, but instead as a combination of research techniques and a distinct kind of written account. Assessing the precise impact on the asylum determination process of the different communicative practices analysed in this chapter is not always a straightforward matter. In some cases, the nature of the effect is relatively clear and direct, as illustrated by the problems that having to rely on telephone interpreting caused for the OFPRA case-worker and asylum applicant in the admissibility interview described above. It is much more difficult, however, to evaluate the part played by conversations in staff offices and corridors, for example, on decision-making about specific asylum applications or appeals. This would require a much more detailed examination of the different factors that can influence the decision-making process, an exercise undertaken by the contributors to the final section of this collection but outwith the scope of the present chapter. Nevertheless, ethnographic research on different forms of communicative practice has, as I have aimed to show here, an important contribution to make to broadening and deepening knowledge and understanding of the complexity of refugee status determination processes, not only in France and other European countries, but elsewhere in the world too. While the research was taking place, a non-governmental organisation published a report, based on an analysis of 96 decisions, in which it argued that there was evidence of a ‘drift (dérive)’ in this type of interview towards a more in-depth examination of, for example, the credibility of the applicant’s account, making it in practice similar to an asylum interview (Anafé 2008). At the time of the research, admissibility interviews with applicants held in other waiting zones (for example, at Orly airport or in French ports) were conducted by telephone rather than face to face. Since then, however, these interviews have increasingly been carried out using video-conferencing software (see OFPRA 2015: 18; Palluel 2016: paragraph 19). In 2009, 76% of OFPRA interviews were conducted with the assistance of an interpreter, compared to 46% in 2003 (OFPRA 2011: 106). Current asylum procedures in France differ in several important respects from those described here, particularly in relation to OFPRA interviews. Following new legislation that came into force on the 1st November 2015, a barrister (avocat) or a representative of an authorised human rights organisation can now be present with an asylum applicant at their OFPRA interview. The applicant can also ask to receive a copy of the ‘transcription’ of the interview produced by the OFPRA case-worker before a decision is made on their application (although in the case of applications examined under the ‘fast-track’ procedure, it may be provided together with notification of the decision). In addition, a sound recording (enregistrement sonore) of the interview is made, and the applicant can subsequently obtain access to this if their claim is rejected. For further information on the current procedures, see CESEDA (2017), OFPRA (2015) and Palluel (2016). In the other two admissibility interviews I observed before the one discussed here, no interpreter was used, as the case-workers conducted them directly in Arabic and French respectively. Social scientists working in other areas have suggested recently that greater attention should be paid to corridors (see, notably, Armstrong 2015). It would be interesting to investigate more thoroughly their role(s) as sites of interaction and communication in the asylum process. I wish to thank François Bernard (former president, CNDA) and Jean-François Cordet (former director general, OFPRA) for granting me permission to conduct interviews with staff at their respective institutions; to Vera Zederman (director, Legal Information Centre, CNDA), and Pascal Baudouin and Myriam Djegham (Research and Communication Service, OFPRA) for arranging interviews with staff; and to the individual members of staff who agreed to be interviewed. In addition, I am grateful to Anthony Good, Nick Gill, and Véronique Péchoux (Head of Mission, Asylum at the Borders, OFPRA) for their very helpful comments on an earlier version of this chapter. Funding: The research was supported by the Arts and Humanities Research Council (grant number AH/E50874X/1) under its Diasporas, Migration and Identities Programme. Anafé (Association nationale d’Assistance aux Frontières pour les Étrangers/National Association for Assistance to Foreigners at the Borders). (2008). Réfugiés en zone d’attente: Rapport sur les dérives de l’examen de l’asile à la frontière. Paris: Anafé. Available at: http://www.anafe.org/IMG/pdf/anafe-rapport-asile-10-09-08.pdf. Accessed 6 Jan 2017. Armstrong, S. (2015). The Cell and the Corridor: Imprisonment as Waiting, and Waiting as Mobile. Time and Society (Early Online Publication). Available at: http://journals.sagepub.com/doi/abs/10.1177/0961463X15587835. Accessed 19 Dec 2016. CESEDA. (2017). Available at: https://www.legifrance.gouv.fr/. Accessed 6 Jan 2017. Cimade. (2010). Voyage au centre de l’asile: Enquête sur la procédure de détermination d’asile. Available at: http://www.lacimade.org/publication/voyage-au-centre-de-lasile/. Accessed 6 Jan 2017. CNDA (Cour nationale du droit d’asile/French National Court of Asylum). (2009). Rapport annuel 2008. Montreuil: CNDA. Available at: http://www.cnda.fr/content/download/5113/15469/version/1/file/cndarapportannuel2008.pdf. Accessed 6 Jan 2017. OFPRA (Office français de protection des réfugiés et apatrides/French Office for the Protection of Refugees and Stateless People). (2009). Rapport d’activité 2008. Fontenay-sous-Bois: OFPRA. Available at: https://ofpra.gouv.fr/sites/default/files/atoms/files/rapport_dactivite_2008.pdf. Accessed 6 Jan 2017. OFPRA. (2015). Guide des procedures à l’Ofpra. Fontenay-sous-Bois: OFPRA. Available at: https://ofpra.gouv.fr/sites/default/files/atoms/files/guide_de_procedure-ext_web_10-11-2015_vd.pdf. Accessed 14 Apr 2017. Palluel, C. (2016). Le nouveau régime de la demande d’asile en rétention administrative: des garanties en trompe-l’œil. La Revue des droits de l’homme (Online), 10. Available at: https://revdh.revues.org/2470. Accessed 10 Apr 2017.